The EmDrive is a fascinating anomaly. It consists of a truncated metal cone (cavity) with a magnetron inside that inputs EM radiation with the same wavelength as the size of the cavity (it's just like a loudspeaker-shaped microwave oven). It has been shown by three different groups (UK, China, US) that when a resonance is achieved the cavity moves slightly towards its narrow end in apparent violation of the conservation of momentum, since there is no expelled mass to cause this. There was a suspicion that the movement was due to air currents, but NASA have just this last week shown that the same thing happens in vacuo. In previous blogs I showed that MiHsC predicts the EmDrive thrust reasonably well, if it is assumed that photons have inertial mass which is caused by Unruh radiation whose wavelengths must fit inside the cone. MiHsC predicts that more Unruh waves fit in at the wide end of the EmDrive, so for photons traveling along the axis they always gain mass going towards the wide end and lose it going the other way. This is equivalent to expelling mass towards the wide end, so the cavity moves towards its narrow end to conserve momentum. where P is the power input (in Watts), Q is the Q-factor (number of bounces of a typical photon inside the cavity, L is the axial cavity length, c is the speed of light, ws and wb are the diameters of the small and big ends of the truncated cone. I have now applied Eq. 2 to the data I had before, and added the new vacuum result from NASA. I've put everything into Table 1 which shows results, row by row, for the two Shawyer (2008) tests (denoted Sa and Sb), the Cannae Drive test (Ca), the Chinese Juan et al. (2012) tests (J1 and J2), the NASA tests of Brady et al. (2014) (Ba, b, c), the recent NASA vacuum test (Bv), and last but not least I've just added Tajmar's (2015) vacuum test (T1). Thanks to Dr J. Rodal for pointing out some errors in the NASA cavity's dimensions. I've now doubled the Tajmar dimensions too. The results show a correlation between the observed thrusts (column 8) and the predictions of MiHsC (column 9), but with varying degrees of success: for the smaller NASA thrusts the error ratio is between 2 and 12, for the larger thrusts it is between 2 and 4. So, as usual, these results are interesting enough to record, but nothing yet to write to Nature about. Note that for J1 and J2 I've had to assume that their cavity dimensions were the same as those for Shawyer b, since their geometry was not documented. If anyone knows the dimensions, or notices any errors in the Table please do let me know! A summary of the Table is shown as a log-log plot below (I had to use a naughty log-log plot to separate the tiny NASA values). Some of the discrepancy between MiHsC and the data could be due to an observation pointed out by Bob Ludwick that I read on a website somewhere: the Chinese noted that the correct parameter to use is not the Power P, but the power within the resonant bandwidth of the EmDrive, which is harder to calculate. Some of my previous blog entries about MiHsC and the emdrive are here and here. My paper is here. Juan, W., 2012. Net thrust measurement of propellantless microwave thrusters. Acta Physica Sinica, 61, 11. Shawyer, R., 2008. Microwave propulsion - progress in the emdrive programme. Link. (see section 6, page 6). Tajmar, M., G. Fielder, 2015. 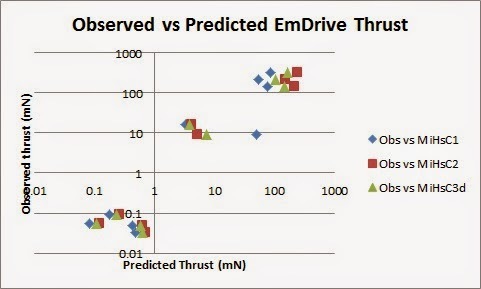 Direct thrust measurements of an emdrive and evaluation of possible side effects. 51st AIAA/SAE/ASEE Joint Propulsion Conference, Orlando, Florida. Thank you for deriving and posting your 3-D expression for the thrust of the EM Drive. Please note that Paul March (from NASA Eagleworks) recently disclosed the dimensions of the truncated cone used for the NASA Eagleworks experiments as 27.94 cm; 15.88 cm; 22.86 cm; just as you listed for the experiment recently done in a hard vacuum, except that ALL the NASA tests (including all the previous tests you list as a, b and c) also had the same dimensions. The dimensions you have for the previous tests (a, b,and c) were estimates. Now we have the official dimensions 27.94 cm; 15.88 cm; 22.86 cm. Mike, I don't know how closely you are following the EM Drive thread at NSF, but the last page or two of posts might interest you. Apparently, this device has a 'reverse.' Don't know what that does for your theory. Thanks, that's new. I'll take a look..
A reverse mode could happen in MiHsC as follows: if the Unruh waves are tuned to fit in the mid-diameter as I usually assume, then it'll thrust towards the small end because fewer Unruh waves will be allowed there by the cavity walls. If the Unruh waves are tuned to fit within the small end and not at all at the big end then more waves would instead be allowed at the small end, so thrust could reverse. This also suggests a way to enhance thrust: tune to the large end. Do EM Drive theory would apply to two concentrics spheres? I can only answer your question in terms of MiHsC. In MiHsC the two concentric spheres would show no anomaly because MiHsC would predict a force equal in all directions due to the symmetry, so there would be no movement. I hope that answers your question. If they weren't quite concentric it would be different..
Mike, a bit of a heads up here. If you are not already watching the EM Drive thread at NSF, the pace is picking up. Site Administrator (Chris Bergin) dropped in, and mentioned something about looking for people to write a formal news article on this device. Your theory keeps getting brought up. Might be your chance to make a case for your theory. Hi Tim. Thanks, I'll try to stick my oar in to the NSF forum today. Quoting : "If they weren't quite concentric it would be different.."
The question is related to conical shape of the publicly exposed EM drive device. In fact, the real question would be: what's the most effective shape to produce thrust? Maybe a "double hourglass" ie cone 1 connected to smaller cone 2 with waveguide would work? Dear Andre. Can you clarify what shape you mean? What matters in MiHsC is the asymmetry along one direction of the allowed Unruh modes. Lots allowed at one end, few at the other. Given that, then for example a non-truncated cone should be better. does your model allows static (against gravity) force around 10000N (ton.g) with superconducting cavity (highQ) and energy<1MWe ? finally if static thrust prevent falling, what would be the effect of horizontal acceleration ? or independent vertical acceleration ? would it kill the vertical thrust? From what shawyer explained I interpret the thrust as a kind of "sky-table" to avoid falling, far from the capacity of a reactor who can raise you as strongly as he can hold you, is it right? OK. I calculate using the 3d MiHsC formula (Eq. 2 above) that for the NASA truncated cone: l=22.86cm, w_big=27.94cm, w_small=15.88cm, Q=50,000, assumed mass=100kg?, then to counter gravity (for a trunc'd cone pointing up) you'd need 2.9MW. That is not so for taking off earth. But for a satellite it is great. 1MW today can be produced as heat with few kg of nuclear fuel, but for conversion, efficient turbine I see 4-10kW/kg thus 100-250kg per MWe. according to you theory, does it scale up that way as he predict with his own theory? "The second generation engines will be capable of producing a specific thrust of 30kN/kW. Thus for 1 kilowatt (typical of the power in a microwave oven) a static thrust of 3 tonnes can be obtained, which is enough to support a large car. This is clearly adequate for terrestrial transport applications. The static thrust/power ratio is calculated assuming a superconducting EmDrive with a Q of 5 x 10^9. This Q value is routinely achieved in superconducting cavities." I hope some team get the budget to test in a micro-satellite. The Mach Effect Thruster of James Woodward is a dual to the EM-Drive for what concerns exotic propulsion. 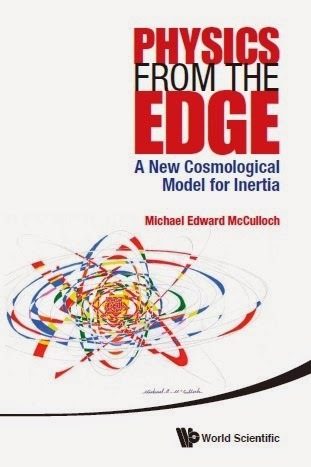 They both use the light shed on inertia by respectively General Relativity (Taylored to Mach principle accomodation by transactional interpretation of inertia) and quantum mechanics (Unruh radiation) to show and demonstrate the possibility of "exotic propulsion". Can this coincidence be used to understand better the relations between the General Relativity and the Quantum Mechanics ? Photons carry kinetic energy and deliver that to the drive walls. Since the emission in a standing wave is based on emitting from the "aether", it like delivering kinetic energy from a separate object. i.e. Standing on the ground and pushing the drive.